For daily cleaning use mild dish soap, warm water and a soft clean cloth. You can also use any water based spray cleaner. Your countertops have been sealed prior to installation. If you purchase your stone from Da Vinci Stone, your stone has been sealed with a 15-year sealer, so you won’t need to seal your stone for some time. However, if you have a granite counter not from Da Vinci, you will need sealing every couple of years depending on the stone’s porosity and your daily use of the countertops. A select few granite and most marble, limestone, and travertine require an immediate application or multiple applications of sealer by the homeowner. Sealing works as a stain inhibitor and prevents the majority stains and soil from being absorbed into the surface, but it is not a guarantee against staining. 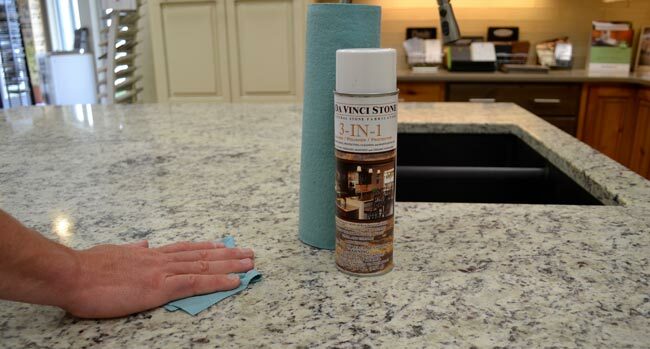 To seal your granite countertops, we recommend the Stone Tech Professional Care System which is available through Da Vinci Stone. Confirm your countertops are clean and free of spills. Stains should be removed prior to sealing. You will need 3 clean, dry, soft cloths and stone sealer. Pour a small amount of sealer, roughly the size of the bottom of a pop can, onto the countertop and distribute evenly with a dry cloth. Pour more sealer onto the stone as you move to other areas of the surface. Allow the sealer to penetrate the stone for at least 20-30 minutes. If the sealer is soaked up by the stone quickly, which is common with marble, limestone, travertine, and onyx, repeat step 2. Take a separate dry cloth and wipe the excess sealer off while it is still wet. If the sealer has already dried, apply a bit more sealer and wipe it off. This will remove any residue. Once all excess sealer has been removed, use a clean dry cloth for a final wipe down.